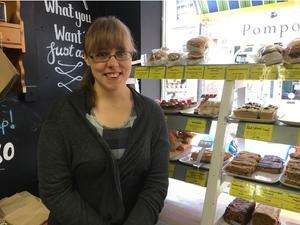 My name is Lucy and I work at Currant Affairs a small, independent vegan wholefood store in Leicester. I went pescatarian when I was 13, mainly due to my Aunt’s influence. She was the first person I knew who ate differently, and who made me think about where my food came from. The more I learnt about the meat and dairy industry, the more I wanted to switch over to a completely plant based vegan diet, and I made the switch to a fully vegan diet at age 16. Initially it was solely for ethical reasons, but I also developed and interest in health and nutrition, and followed an almost 100% raw vegan diet for roughly 4 years in my early twenties. I love making food. I like making simple, whole foods, using lots of veggies and pulses predominately. My favourite foods are sweet fruits like dates, figs, mangos and persimmon, and my favourite quick meals to make are quinoa/millet salads and stir-frys. I love Japanese inspired dishes too. Breakfast is usually a couple of bananas and some fresh dates, or a mango. I always start the day with fruit. Lunch and snacks throughout the day vary depending on where I am and what I’m doing… If I’m at work, I will take fruit with me to snack on, and make myself a basic salad for lunch. It’s hard not to snack on samples of cake/flapjack that we have out for the customers to try however! If I’m at home I tend to graze on fruit, dried fruit and nuts throughout the day, and sometimes have crackers with nut butter. For dinner I like to make a huge salad or stir-fry, but if I’m cooking for more than just myself, I will make various dishes such as wraps, chilli, sushi, coconut curry etc. I like to throw in as many vegetables as I can! I could not live without dates! I love them. And salad. I can’t go very many days without salad. I don’t really miss any foods… Having eaten a plant based diet for my whole adult life, I don’t really remember what I used to eat. It certainly helps to work in a wholefood store. I follow a diet that consists mostly of whole, fresh, unprocessed foods, and I feel that all plant based foods are important. They all contain a variety of nutrients, vitamins, minerals, carbohydrates, proteins and fats, which are all important for a healthy lifestyle. Dark green leafy vegetables are pretty super, but it’s all good really. Definitely. Although interestingly I felt less healthy when I was following a 100% raw food diet. I feel like the variety of plant foods I have, raw and cooked, has made me stronger and happier than my raw food days. I am also my more sociable with food now than I was, and enjoy meals out occasionally, and trying out unusual recipes etc. Having a regular exercise routine and more time to enjoy hobbies has also played a significant part in my health and well-being. I am vegan, and I identify as such. It has had a major impact on all areas of my life. I am more environmentally conscious, I enjoy cooking, learning about nutrition and health, and have a strong moral and ethical stand point on the welfare of animals and humans alike. I would not be working where I am, and enjoying the company of the people I do had I of not been vegan, or interested in a plant based diet. It has motivated me to travel to festivals to find like-minded individuals, make friends with a hugely diverse group of people, and gently encourage my non-vegan family and friends to adopt more healthy practices. Try it! Go slowly, and experiment. Don’t think of change as all or nothing. Even just adding a few more greens to a meal, or swapping out one meal a week to a completely plant based one is a great step in adopting a more adventurous and healthy lifestyle.